Accountability is taking responsibility for your own actions. It goes even deeper than that. 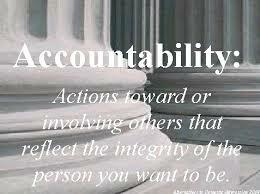 When you are accountable, you gain the respect of others both in your personal and professional life. I am sure you have heard the phrase “He is a man of his word”. We value those that can live up to our expectations and look at those individuals with a certain level of respect and dependability. Randy Pausch,author, The Last Lecture . What Happens When You Are Not Accountable. One becomes to be irritable, demanding, hard to get along and critical of others because you begin to impose your false standards of what is expected of them. The only accomplishment to this point is to create a false person with unrealistic views and without change will continue to corrupt ones life. Once this habit of refusing to accept personal responsibility is maintained, your character can become slowly transformed. You may tend to become someone who is irresponsible, a quitter, reliant on others, disturbed, unhappy, hopeless, angry, irrational, and defiant. These qualities are not success enhancers. The Time Is Now! Take Charge! Do you remember, when you were able to take responsibility or observed another doing so, it may have been difficult although should have rewarded. By being able to free yourself from what is holding you back will begin to remind you of happier more confident times. Practice is the key to success. First realize blaming others for your choices is not good practice. Making mistakes are human, admitting your errors will get you respect. Pretending to be some one you are not is an indication of low self-esteem; work on your own self-esteem and personal growth. No need to feel you are less important, inferior or unworthy. Build self-confidence which with lessen the feeling of being defensive when you make a mistake. Show compassion and empathy to others, and you cannot appear self-centered. Insecurities are created by fear of judgment or failure. Learn tools to work with and overcome your fears. ACCEPT YOURSELF FOR ALL YOU ARE. BY being objective, it eliminates bias or prejudices. Stop being the victim and feeling bad for yourself. Develop a spiritual self which can strengthen your self-awareness. Loss of Freedom – Although it is not always in the forefront of our minds, we as humans do not want to feel that we cannot control our own minds. This is instilled as a child. We thought about the consequence of what will happen if we do not make the right decision, would we get in trouble? (Being grounded, suspended from school, etc.) Later in the life, the consequences may be more severe such as losing our job, finances, or family. Throughout our life, decisions need to be made where there is a risk involved. Fear of the Unknown – This goes back to again, not always being able to control the outcome of an event or our own lives. That is sometimes a hard part for us to digest. We often resist change or taking a chance, because doing what we already know is “safe” and the outcome is more predictable. After a long life of being “safe”, how exciting do you think that is? With every risk we take is an opportunity and an outcome. What we can guarantee to walk away with is a lesson. Often we do not take the time to see what that lesson is. Pain – This would apply to both mental or physical pain. If we know that an activity is going to hurt us, it is less likely we will move forward to do it to avoid the physical pain. The same goes for taking the chance to express a feeling or a position on a topic. We do not want to feel the personal pain, so we bite our tongue and hold in the emotions we are feeling. This would be part of the reason why the medical field is a multi billion dollar industry providing medications to soothe us from feeling the physical or emotional pain at one time or another. Disappointment – This fear starts early on, as we are children. Often as a child we didn’t always make the right decision and got in trouble. Can you remember a time in your life when you were told that you disappointed someone? Maybe a parent, grandparent, or teacher? Often that stands out to us more and hits our heart, where we feel regret. We begin t doubt ourselves and wish we did things differently. As an adult maybe you made a poor decision in your job or career and disappointed someone else or yourself with the decision you made. We then wonder, if we had handled it another way, would it have changed the outcome? Misery – Misery is something we never want to feel or see anyone else fear. Media feeds into this often by causing us to feel constantly that we need more than we have, or we are not good enough the way we are. 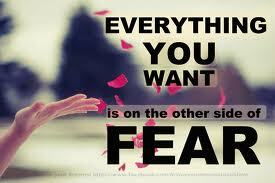 I found this quote which I think says it all :&quot;Fear is the greatest cause of Misery in the world. It is the greatest of all superstitions. It is the cause of all our woes. The moment you fear you are nobody. Loneliness – We often fear being alone, which is a deep feeling of emptiness. We thrive as humans with personal interaction and companionship in healthy relationships. This also stems from a survival instinct, where we are more likely to make it through if we are with a partner or others. We want to be heard and acknowledged for our accomplishments, and often want to feel wanted or needed. Ridicule – We want to project ourselves a certain way and want to be seen for who we are that reflects our core values. We fear making a poor decision and being judged or ridiculed. Often at one point in our life someone has said something to you, that really stuck:. Unfortunately it may not have been so nice, and at any time we can trigger that negative thought, remembering the words and the feelings we experienced as if it was yesterday. Death – Being afraid of death, although at times makes us aware of our surroundings and alert it can also be a crippling fear that leaves us feeling caged or trapped. When someone fears death, we may be telling ourselves a story that often is made up or has not even happened. You will notice this happening, the sentence may start as “What if” …; Learning to become more present, and helps us from projecting these thoughts. Living in the now can prevent us from projecting these thoughts. Failure – This is the most common fear, and really the stem of all other fears. We often will do anything possible to avoid failing. Failure can mean a lot of different things. . . A poor outcome, not achieving your intended goal, feeling stuck or no hope, or a judgment passed by someone else falsely telling you “You are a failure” That really stick and cuts to the bone. I saw a great article today on “How the fear of failure destroys success” I wanted to share with you. It inspired me to write this blog today. When was the last time I took a chance? When was the last time I felt alive? When was the last time I failed? When I failed did I keep going? Has there been a time in my life I failed, but kept going anyway? What did it feel like and what was the result? I can tell you right now if you have never failed you are lying to yourself or you are not living. If you are interested in overcoming these fears or signing up for one of my upcoming classes, please send me an email or follow me on Facebook. I would love to hear from you, I encourage you to leave your comments and thoughts below.